The river otter's playful antics endear them to children and adults, but the creature has nearly disappeared from lakes and rivers around the world. Once inhabiting nearly all large rivers, river otters have been hunted for their thick, waterproof fur. 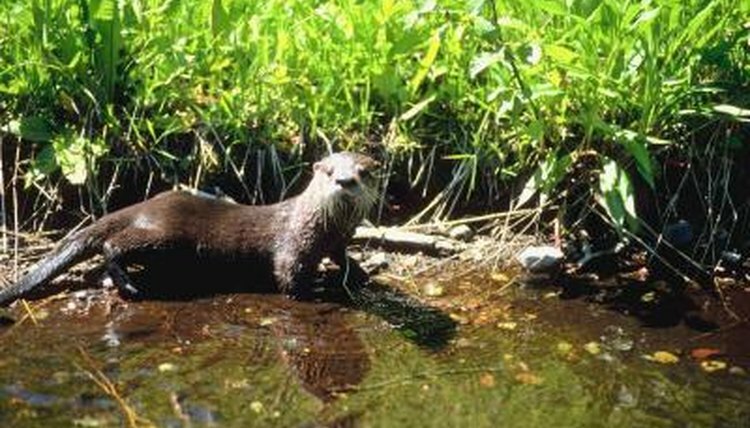 In addition, water pollution affects otters by killing their natural prey, fish, severely reducing many species' populations. The familiar face of the North American river otter (Lontra canadensis) has disappeared in many states due to habitat loss, water pollution and trapping. While not endangered nationwide, the range of river otters has been severely reduced -- by 1980 river otters had disappeared from 11 states. Today, ongoing efforts are in place to reintroduce otters to their former habitats in Illinois, Indiana, Ohio and Pennsylvania. A South American native, the southern river otter (Lontra provocax) has a habitat extending from Argentina to Chile and its coast. The International Union for Conservation of Nature and Natural Resources lists this otter as endangered because of the destruction of habitat and illegal hunting, which has reduced the available habitat to seven isolated locations. The giant river otter (Pteronura brasiliensis), also known as the giant Brazilian otter and giant otter, is the largest river otter species in the world. At 6 feet long, this species is twice the length of other otter species. Native to South America, giant river otters are mostly found in the Amazon basin. Preferring slow-moving tropical rivers, the giant river otter is affected by habitat loss, illegal hunting and gold mining that has caused mercury poisoning. Current estimates place the population between 1,000 and 5,000, placing it among the endangered otter species. Native to southeast Asia, the hairy-nosed otter (Lutra sumatrana) has had a 50 percent reduction in population in the last 30 years due to poaching, pollution and lack of prey fish due to overfishing. Little is known about the species, the rarest of Asian otters; it was believed extinct until small populations were discovered in Cambodia, Sumatra, Thailand and Vietnam.